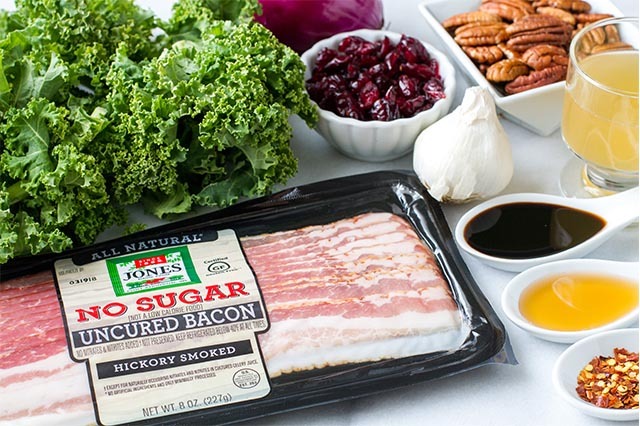 Jones Dairy Farm, a 130-year-old family owned business best known for pioneering all natural breakfast sausage, has announced the Paleo Certification for its All Natural Uncured No Sugar Bacon, the 14th Jones product to receive the designation by the Paleo Foundation in the past year. Jones All Natural Uncured No Sugar Bacon is special because of the way it’s made, and it’s a difference you can taste. Jones starts with fresh center-cut pork bellies that are never frozen. Center cut means it’s a leaner, meatier section of the pork belly. The bacon is then naturally smoked using only real hickory wood providing a rich, authentic, crave-worthy taste. Injected liquid smoke is never used. Certified gluten free and now certified paleo too, this All Natural Uncured Bacon contains no added nitrates, nitrites, artificial preservatives or MSG. The Certified Paleo designation means that Jones All Natural Uncured No Sugar Bacon contains no grains, legumes, dairy, artificial colorings, preservatives, artificial sweeteners and flavor enhancers. The product is currently available in select retailers nationwide. Visit www.JonesDairyFarm.com for more information about the company and to access the company’s product locator.